Mike Pence's tight relationship with his wife doesn't mean he respects women. 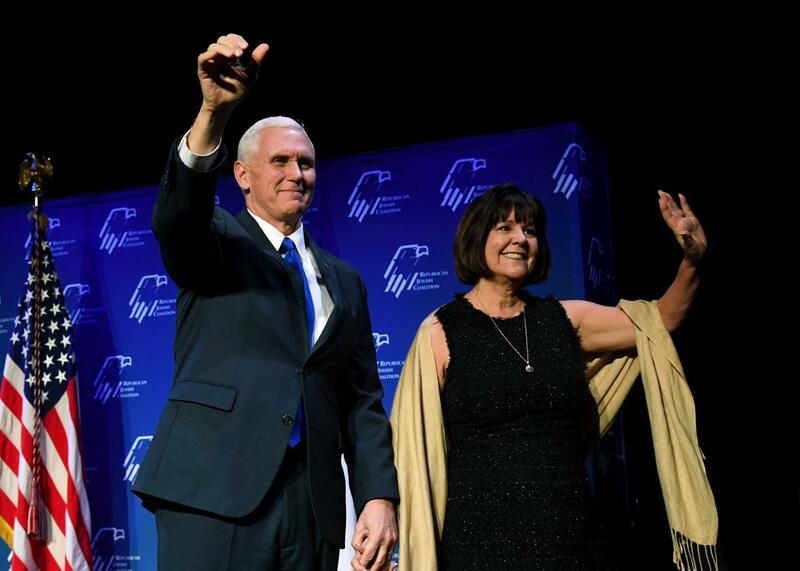 Vice President Mike Pence and his wife Karen Pence at the Republican Jewish Coalition’s annual leadership meeting in Las Vegas on Feb. 24. You’ve likely already heard about him allegedly calling her mother, the gold cross engraved with the word “Yes,” and the hollowed-out bread proposal. (You may not have known it was possible to get bread “shellacked” as a keepsake, though.) But the main thing the Post does is paint a picture of an extremely strong partnership between the VP and his wife, signified by a red phone in Mike’s office back in his House days to which only Karen had the number and later on by their twin treadmills in the Indiana governor’s mansion. Present-day Karen is considered the “force behind her husband’s socially conservative stances,” and she will likely keep an office alongside her husband in the Eisenhower Executive Office Building. Unlike Ivanka Trump’s West Wing office, it’s not a break from tradition for a second lady to set up camp at the EEOB. Also in ostensible contrast to members of the Trump family, Karen has said that she “never weighs in on or attempts to influence policy.” Still, she accompanies the VP on foreign trips and in interviews. President Trump knew when the Access Hollywood tape came to light that he had better apologize to her directly. But what does that “influence” amount to? Maybe partnership was too strong a word. For all the consultation and trust and faith the Pences share, their marriage ends up looking like a pretty traditional, patriarchal-figure-privileging one, with Karen providing the support and “gut checks” that allow the Vice President to do his job in public. Being a “prayer warrior” sounds intense, but I bet it involves a lot of emotional labor of the sort women often end up supplying. Another detail stuck out in the Post piece: The article cited a 2002 story in the Hill in which Mike Pence said that “he never eats alone with a woman other than his wife and that he won’t attend events featuring alcohol without her by his side, either.” As writer Laura Turner and others pointed out on Twitter, some of this has roots in evangelical Christian communities, where “the Billy Graham rule” dictated not meeting alone with women other than one’s wife. We don’t know how strict Pence is about following this rule or how far he takes it, but this kind of thinking does point toward a pretty radically retrograde mindset on the part of its adherents, one that doesn’t respect women as humans with thoughts and skills to contribute but rather sees them primarily as sexual temptations. Considering this context, sure, Mike Pence is close to his wife; but she’s also literally the only woman he’s allowed to talk to in many common social situations. Aggressively following this rule, one can imagine, would seriously compromise one’s ability to work with or gain insight from women who aren’t Karen Pence (who says she doesn’t want to impact policy anyway, as she’s busy conducting prayer warfare). As Elizabeth Spiers, a writer and entrepreneur who was raised as an evangelical Christian, put it, living this way would mean someone wouldn’t be able to have much of a working relationship with any woman, and furthermore, “I also wonder if, taken to a logical extreme, Pence could argue that he shouldn’t have to hire women on a religious freedom basis.” We knew that Trump’s administration is one of the most male-heavy in recent history. Now we know that may not be a coincidence, what with men at constant risk of temptation. All the art therapy in the world can’t fight man’s animal nature, apparently.